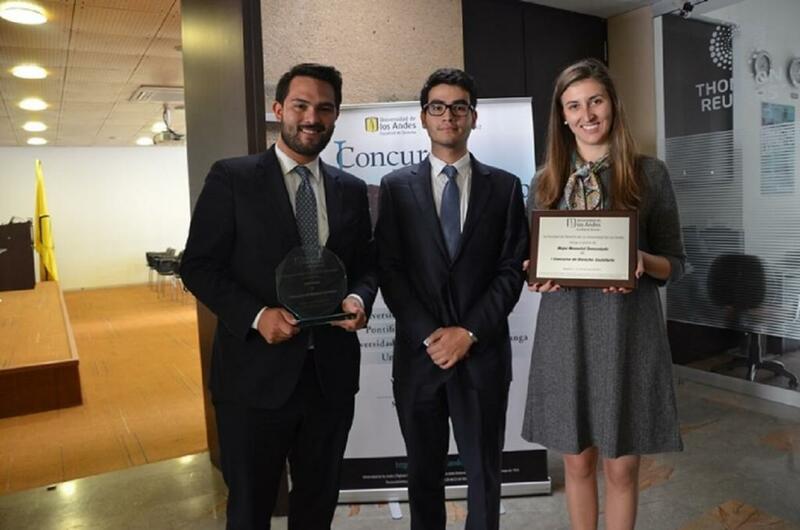 Óscar Rosales, Alejandro Ortiz, and Laura Streubel were the student members of the team, which was directed by Sergio Londoño and Juan Amaya and won the prize for the Best Defendant Petition. The 1st Company Law Competition was held on the 17th and 18th March, and it was the first of its kind in Latin America. It was organized with the help of the Private Law area, which is part of the Faculty of Law at the Universidad de los Andes. Due to the lack of spaces other than classrooms to discuss complex legal problems in great depth that relate to company law, a group of students and alumni from the Faculty of Law decided to create a competition that was a setting, involving other Colombian universities, in which the aforementioned issues could be analyzed. As part of the oral rounds, the participating teams presented to a panel of experts that were constituted by lawyers from well-known Colombian legal firms including, Brigard & Urrutia, Philippi Prietocarrizosa Ferrero DU, and Uría & Garrigues. In the first rounds, the team from Los Andes first faced the team from the Universidad Externado de Colombia as the defendant and then the team from the Universidad Santo Tomás from Buraramanga as the plaintiff. Later on in the competition, Uniandes once again faced the Universidad Externado de Colombia as the defendant. The panel of judges was made up by Francisco Reyes Villamizar, current Superintendent of Companies; Jorge Pinzón Sánchez, former Superintendent of Companies; and Gustavo Cuberos Gómez, founding partner at Cuberos Cortés Gutiérrez law firm.